This is a straight reissue of the AMT 1970 Chevrolet Chevelle SS, but presented this time round as the car driven by Tom Cruise, playing Jack Reacher in the 2012 movie of the same name. Mat Irvine: This is an attractive kit that does justice to the original machine, and one that will look good if you build it straight from the box. You do get two build options, though these are really only down to alternative wheel sets and either a carburettor or fuel-injected engine. Overall, the emphasis is on building the car stock, and anyway the Chevelle was also a ‘hot’ car in the Chevrolet range, and this is the top SS (Super Stock) version. Consequently, the Chevelle made a suitable choice of wheels for a hero such as Jack Reacher - though maybe anti-hero is a better term for him. Inside the box are neatly presented mouldings (below) with 82 components, decals and instructions. Building the AMT Chevelle is straightforward, with three basic assemblies making up the finished car - engine and chassis, interior, and bodywork. The chassis itself boasts more parts than an original 1960s kit, when several components would have been moulded into the chassis pan. Now the drive train and exhausts are separate parts, but everything still goes together in a very easy manner. The front moulding bar needs cutting away (below) between the headlamps. You may also find that the headlamp openings themselves could benefit from opening out slightly with a file. Possibly the only point to watch is where the headlamps fit through the body moulding. The lights are moulded in with the grill and bumper, but the Chevelle has separate openings for them in the front body panel. The stock wheels (below) were treated with a wash of black paint to emphasise the inner areas, as shown by the two on the right. The components are moulded in white and chrome, with transparent window glazing. The tyres are black. The SS trunk and hood decal options are supplied in black, and also in white if you are not building the Reacher car. Some early kits had slight problems with the decal pattern, but this is now corrected. You also get the correct Jack Reacher licence plate. The finished body (below) was painted bright red with Bare-Metal Foil added for the brightwork that was popular in 1970s-era cars. The all-black approach, currently in vogue, had yet to come in. The white base plastic makes the kit easy to finish with spray paints, red for the Jack Reacher edition, or any colour you choose if you don’t want to make the movie car. 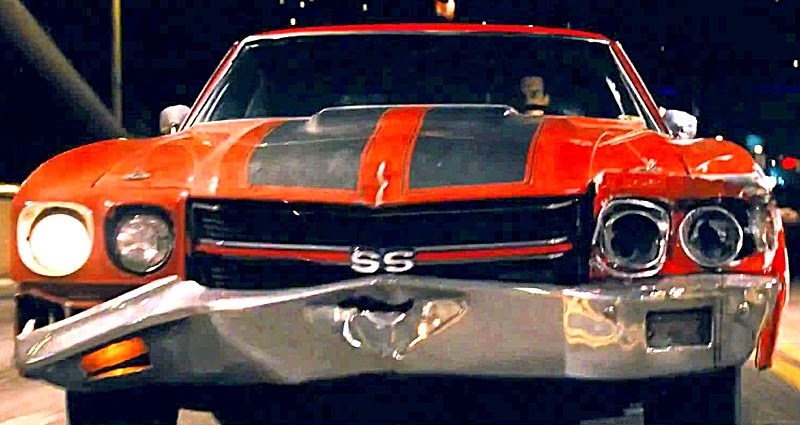 As with any movie car that features in an action sequence, it doesn’t remain in showroom condition for long, so you have the option of building a distressed stunt-car version (below) as it appeared in the film, if you feel so inclined. 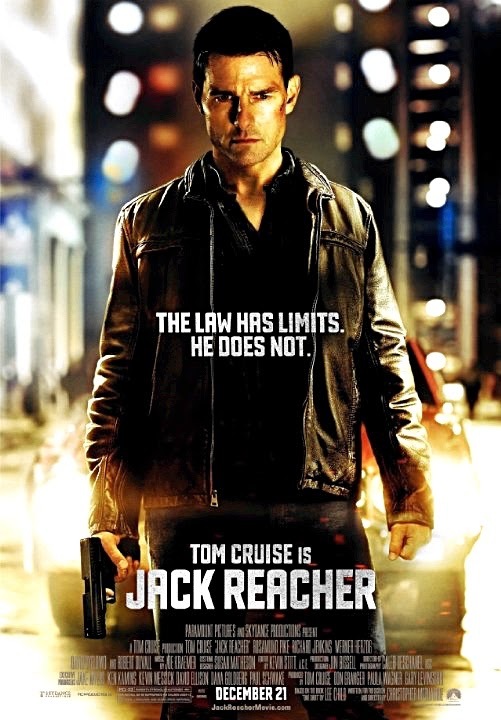 The movie Jack Reacher was based on the novel One Shot by Lee Child, who has written several other books featuring the same character. Oddly enough, despite writing about an all-American action hero, Lee Child is British, coming originally from Coventry, England. Kit history note: By the time of this era of ‘annual’ cars they were somewhat simplified from when these types of kits were first issued. This is a 1970s car and by now the exotic custom options you found in 1960s kits had gone, and invariably any competition or racing version has also disappeared. Closeup (below) of the front hood. Hood pins, which hold the hood closed, and are really a racing feature, are moulded into the kit hood. I replaced them here with after-market accessory parts which look more authentic. I also washed black in the grille opening to add to the look. The hood pins (above, below) come from two separate aftermarket accessory companies, Model Car Garage and S&S Specialities. The unpainted grey hood shows the simplified moulded-in hood pins. Rear view (below) showing the correct movie licence plate. Finished model (below) with box. The earlier kit (below) of the AMT 1970 Chevelle 454, of which the Jack Reacher version is a straight reissue. You can use this kit to build the Reacher car, the only thing lacking in the older kit being the correct licence plate decal. Jack Reacher is a decent action movie, with Tom Cruise in the lead role.